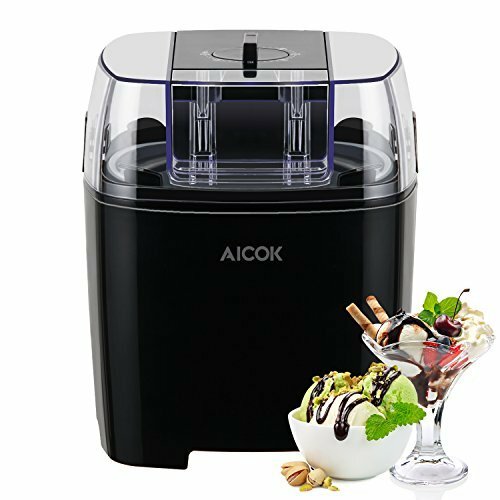 Aicok Ice Cream Maker is quite easy to use. Preparing a fresh batch of homemade ice cream from scratch is a great way for your friends and family to bond and have fun in the kitchen. Making your own ice cream will not only help you avoid the harmful and calorie-laden ingredients present in store-bought treats, but it can even be used to whip up nutritious desserts while boosting your intake of vitamins and minerals. This kitchen appliance also allows you to personalize your mixture and make endless types of frozen yogurt or ice cream. 1.Pre-freezing the inner bowl takes around 12 hours, so we recommend you simply pop it in the freezer the night before. Reminder: The mixing bowl must be completely frozen. you can know this through shaking the container, if can not hear the liquid sound, then already freeze completely. 2. Remove the freezer bowl from refrigerator and fill it with the cooled ice cream mixture in the frozen container and never use hot mixture! 3.Insert the cover with the motor part and the mixing arm, set the timer and start the device. It will be done in just 15-20 minutes. 4.Keep the ice cream machine running while adding the ingredients like chocolate, nuts or fruits through the wide mouth. Reminder: Suggest to put 500-700ml mixture to making ice cream, since it will goes up quite a lot when mixing. READY WHEN YOU ARE: 6 programs and the variable timer ensures that you get gorgeous frozen desserts when you are ready. FAST AND EASY: In no more than 20 minutes, you can have delicious sorbet, ice cream or frozen yoghurt. Experiment with your own creations or use the included recipe book. LARGE CAPACITY: The fast-freezing bowl can take on a substantial 1.5 quart of ice cream, so you have enough to feed your whole family. The detachable mixing arm and freezer bowl are easy to remove for cleaning. ADD YOUR FAVORITE TREATS: Use the spout to add your favorite treats into the ice-cream, whether it's chocolate chips, sprinkles or nuts. WARRANTY - Our 2 Year Replacement or Repayment Warranty for defective products is proof that we stand behind our products. Contact Customer Service 24 hours a day, and we can assist you.